In keeping with Buddhist philosophy of non-harming, Common Ground is committed to minimizing our footprint on this earth. 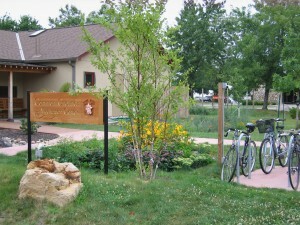 The building renovation that created the new home for our meditation center was completed in 2009, and we incorporated many green building features such energy efficiency, daylighting, and use of non-toxic finishes inside, plus outside features that include decreased impervious surfaces, plantings of primarily native species and an extensive rain garden system for on-site stormwater infiltration. 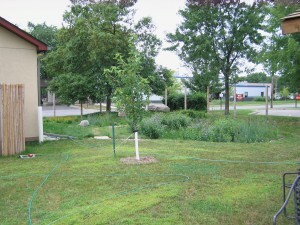 In 2010, Common Ground Meditation Center was granted funding from the Mississippi Water Management Organization to assist in making site improvements that increased green space on the property and created a system of rain gardens to promote surface waster infiltration. Over 700 hours of community member volunteer time was spent planting, watering, mulching and caring for the gardens to establish them in the first 18 months. The grant also included an educational component for our members and the general public. 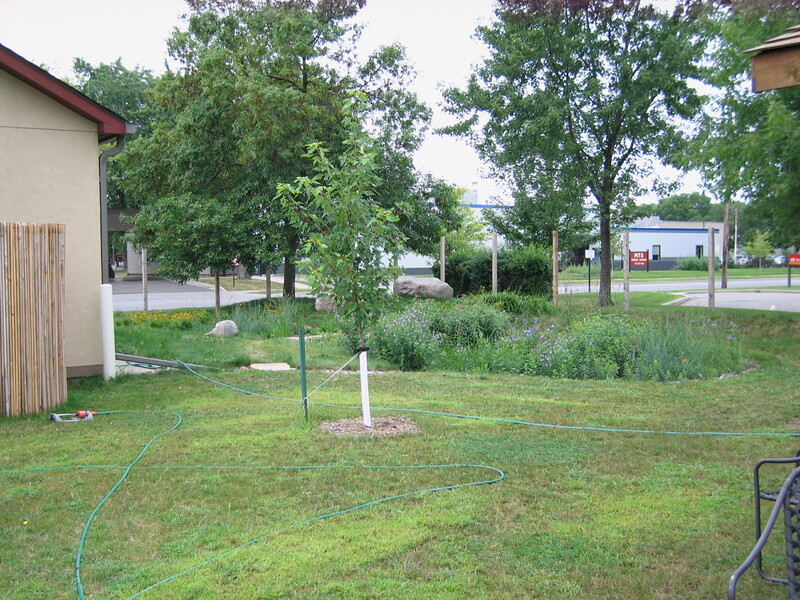 For educational information about this project and how rain gardens work, view the Common Ground Storm Water Management Improvement Project document. Common Ground has implemented a number of initiatives to reduce our waste and also to reduce the toxicity of our purchases. Reusable (washable) dishes, glasses and silverware are used at most events. Office paper is reduced by using electronics and posting items on a community bulletin board. Most communications with community members is via email. Building finishes and cleaning products are non toxic. We recycle paper, metal, glass and plastic, and compost all yard waste. After recycling, we usually produce only 1-2 bags of garbage in a typical week. Common Ground Meditation Center strives to reduce our greenhouse gas emissions and improve air quality by encouraging alternative transportation. Many of our members live nearby and walk or bike to the Center. There are secure, well lit bike racks available for the numerous bikers. 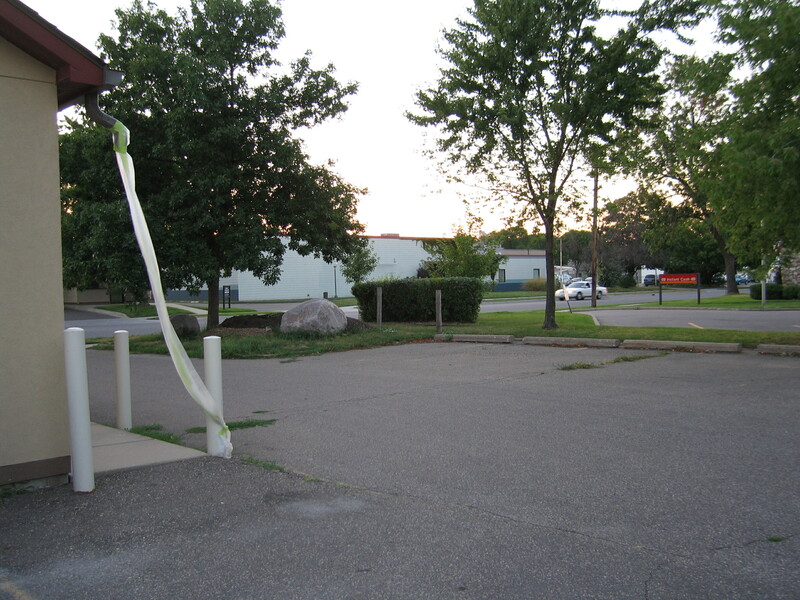 We are conveniently located next to a number of bus routes and near the Lake Street Hiawatha LRT Station. For out of town meditation retreats we offer an online system for carpooling coordination. 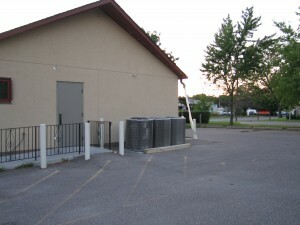 The building is well insulated and has three high efficiency furnaces. We use reminders to turn off lights when not needed; and keep the building at a minimal temperature. We also use energy star appliances, dual flush toilets.